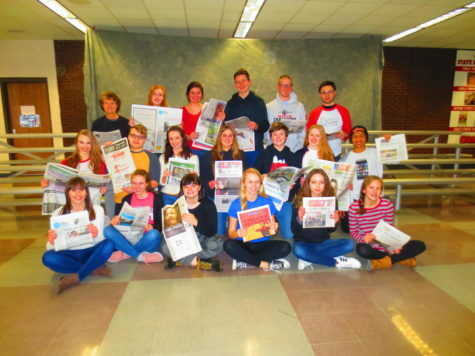 The Satellite is Neenah High School’s student-produced online newspaper. Mrs. Beth Plankey, Journalism teacher at NHS since 1993, advises the paper. The newspaper took shape in the ‘70s as The Cub, evolved into the Satellite and published in print format until 2000 when the paper moved entirely online. NHS is a considered a large school with approximately 1,877 students in grades 9-12. The Satellite is developed outside of the classroom. Students in the Composition for Journalistic Publications class contribute articles during the one-semester course, however, the class is not a prerequisite. Any student may join the Satellite. The Satellite is a registered member of Northeastern Wisconsin Scholastic Press Association (NEWSPA) since 1993. NEWSPA is a thriving program for high school journalists. Satellite members attend its spring conference, where more than 400 students participate in over 40 sessions and panels lead by professionals in the field of journalism. NEWSPA continues to evolve in its preparation of students for the journalism world. The Satellite staff participates in NEWSPA’s writing and photography competitions. The Satellite is an award-winning newspaper. At the 2018 Northeastern Wisconsin Scholastic Press Association (NEWSPA) Awards, the Satellite won 36 awards, including 10 Blue Ribbon Honors.